The next Knesset will be asked to pass a law to bar “Mavi Mamara” Zoabi from the legislature once and for all, Likud MK Danon said. The next Knesset will be asked to pass a law that would put Arab MK “Mavi Mamara” Zoabi out of the legislature once and for all, Likud MK Danny Danon said Sunday, minutes after the High Court overruled a Knesset committee. The court, in a unanimous vote, ruled as expected and gave the Balad party’s list of candidates a green light, despite MK Hanin Zoabi’s having been on board the Mavi Mamara boat nearly three years ago when its IHH terrorists clubbed and knifed Israeli commandos. Before the decision, a petition to ban Zoabi from running for the Knesset gained 11,000 signatures. The Knesset Election Committee decided two weeks ago that Zoabi cannot run, but her appeal to the High Court was accepted. The Basic Law allows the Knesset committee to ban a list of MKs if it includes those who deny the establishment of the State of Israel as a democratic country, incite racism or support armed terrorist attacks by an enemy. “The High Court decided today to support the Mavi Mamara terrorist [Zoabi] instead of Israeli commandos who were attacked with knives and clubs by terrorists of the IHH under the umbrella of immunity of Zoabi,” said MK Danon. He said he plans to introduce a change in the Basic law to get around today’s and previous court rulings overruling the Knesset. “The current law is not working,” Danon said. "The law will be changed and Zoabi can be sure that her days in the Knesset are numbered." The attacks on the Mavi Mamara caught the Navy commandos by surprise. The soldiers were unarmed, except for paint guns and personal revolvers strapped behind their backs. They descended on board by rope from a hovering helicopter to enforce a maritime embargo on Gaza, where the ship and five sister boats were headed. Video footage and photographs proved that the attack was pre-planned. The terrorists kidnapped three commandos and severely wounded several of the soldiers until the troops were able to overcome the attackers, nine of whom were killed. Zoabi did not personally participate in the attacks but was detained, along with more than 600 others, when Israeli naval forces rerouted all six ships to the port city of Ashdod, several miles north of Gaza. Police released Zoabi shortly after her arrest because of parliamentary immunity, and she later told the Knesset, in an angry speech, the IHH attackers did not stage any provocation. 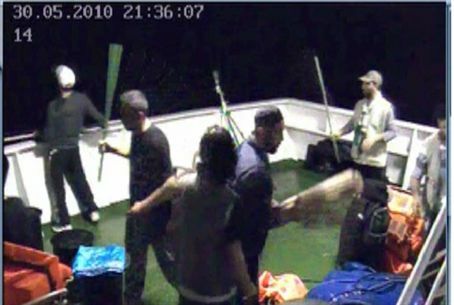 ”It was clear from the size of the force that boarded the ship that the purpose was not only to stop this sail, but to cause the largest possible number of fatalities in order to stop such initiatives in the future,” she later told Israeli media.